One of our Yorkshire holiday cottages, the Coach House Greetland has been beautifully refurbished including many original features such as beamed ceilings. We booked a holiday cottage through Karen from Holidays 4U earlier this month. We were very lucky with the weather – it hardly rained at all and was mostly sunny. As a couple we wanted to spend a lot of time walking and the countryside around our cottage was truly spectacular in this regard. We also drove onto the Yorkshire Moors and the Yorkshire Dales, both of which are beautiful. The cottage was only a 10 minute walk to the nearest pub, which was a good one. Particularly loved the Lancashire Hot Pot – which was delicious. They also allow dogs, which was handy, so our springer spaniel could come along. The cottage was very comfortable both in the seating area in the lounge and also the beds in the bedroom. The master bedroom had an ensuite bathroom, which seemed like it had just been refurbished. The owners left us a welcome pack on our arrival which included a bottle of chilled white wine and even some treats for our dog, which he absolutely loved. The cottage has wifi internet. We always try to book somewhere with wifi, as my husband and I both have businesses which we need to keep updated with, even on holiday. Sad I know! The kitchen was well equipped. As well as the usual items you would expect there was also a dishwasher and a nutri bullet, so we could juice up a nice healthy smoothie for breakfast. There was an outside area to sit out and eat with a patio table and chairs, as well as a swing chair. The cottage also had off street parking and an enclosed area which was very good for our dog. 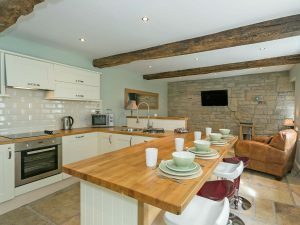 This entry was posted in Yorkshire Cottages and tagged #holidays4uorg, #karendurant, #yorkshirecottages by holidays4u. Bookmark the permalink.